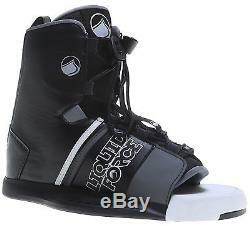 Liquid Force Slab Blem Wakeboard Mens 134cm + Liquid Force Bindings Sz 8-12. The bindings in this package are available in one size, 8-12. 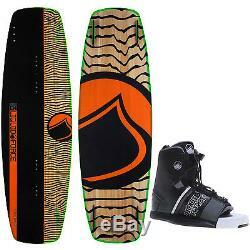 The recommended weight range for a 134 cm wakeboard is 140-180lbs. The binding sizes are based on availability of the bindings. If you have ANY questions we'll respond quickly bringing you 15+ years of riding and instructing experience. Board - The SLAB is built to get everyone into the rail riding game! 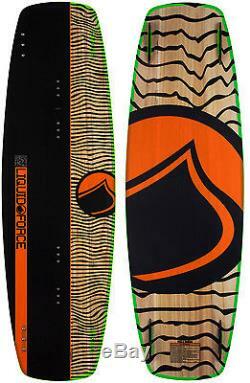 It's an all wood core board that provides a stiff, yet snappy flex to pop off flat water with ease. With a durable Extruded Base and a rounded Liquid Rail, the SLAB offers just enough forgiveness to prevent the hard slams that are inevitable as you progress your way up the jibbing ranks! Whether it's your park and boat board or simply your rail riding quiver board, the SLAB is a super fun, buttery board that will keep you smiling through your entire session! 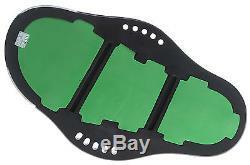 This board has some minor cosmetic defects-nothing that affects the performance. Full Wood Profiled Core - Dialed in for the perfect snap at each size. Clean Flat Planing Hull - Smooth and catch-free on all features. LF Slider Quad Fin Setup. Binding - Key Features of the Liquid Force Element Wakeboard Bindings. N66 Chassis: Injection molded Nylon 6 plastic, 6 inch spread with 12% glass reinforcement chassis that is base in which the binding upper is built. Our foot-bed also features improved toe-lift and better control when on edge. The improved foot-bed also now comes with 6 degrees of built in heel lift that puts the rider into a better "attack" position with bent knees when edging or riding on rails. Impact Displacing/Absorbing foam: This space age material is attached to the bottom of our foot bed in the N66 Chassis. Our specially designed foam displaces high-energy impacts and reduces heel bruises and is featured on our lower to mid range product. Comfort Liners: Our liner features a floating tongue design, which is ready to ride out of the box No heat molding required. Liquid Force liners feature a new, more secure fit and a reduction of material for less bulk and weight this year. Stretch Zone (Back): Integrated Stretch Zone panel designed into the back of our bindings flexes and allows for ease in and out of the binding. Flex Zone: Lateral and Medial molded parts of selected bindings that allow the binding to flex in all directions freely without restriction from materials and hardware. We have lots of brands that can so please have a look through our store or shoot us a message if youre looking for something in particular. We take customer service very seriously. Our priority is to offer the best shopping experience possible. All emails are replied to in less than 24 hrs. 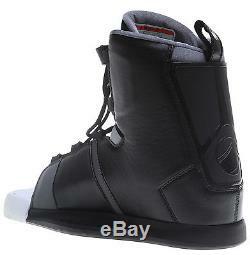 The item "Liquid Force Slab Blem Wakeboard Mens 134cm + Liquid Force Bindings Sz 8-12" is in sale since Tuesday, April 04, 2017.